This one was for a couple of coworkers who share a Halloween birthday. I wanted to do something in keeping with the spooky them of the holiday, and this is what I came up with. I could have done a better job of displaying the spiders, I think...but so many of these cakes were just experiments - I made everything up as I went along. Okay - well, part of the deal in making cakes for people at work was that I needed to have enough cake for everyone. So to solve that issue, the base is a 13 x 9 inch chocolate cake that I covered with fondant. I tinted it green. Why green? Well, it's not JUST green, it's "Juniper Green." So I'm thinking I recently bought some new food coloring shades and I wanted to play with them. Actually, considering that the two loaf-pan shaped layers on top of this first layer were tinted with "Aster Mauve" and "Delphinium Blue" confirms it. Hahaha. No other reason for the colors at all except that they were new. The other new toy I must have purchased right around this time was a piping tip that had lots of tiny holes in it and could be used to make grass or fur with your icing. So that's how I did the spider bodies. I made two chocolate cupcakes. I wrapped them in brown fondant. I made little fondant spider heads. And I piped brown frosting through that tip to give my spiders furry bodies. The legs were the only inedible parts - I used big brown pipe cleaners. And the other decorating was Charlotte-inspired - I piped spider webs on the loaf-pan layers and the green layer, and in the webs I did the "Happy Birthday" thing for each of the two people. 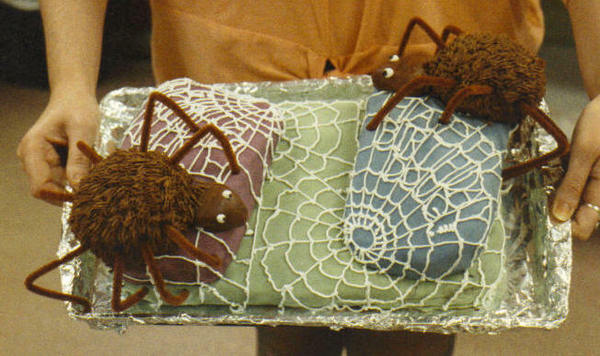 I will tell you that when I was making this cake, I'd made my spiders, and had positioned them on the cake, which was on a work stand in my little apartment kitchen. And every so often I would catch one of them looking at me....it was a little creepy until I got used to them. Kind of cute, aren't they?